i'm on such a reading frenzy lately, i have to start writing book reviews or i'll have nothing at all to write about. 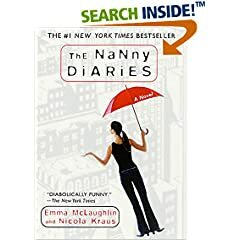 this weekend i read The Nanny Diaries. it was pretty terrible. all the characters, including the protagonist, her love interest, her friends, his friends, and the antagonist family/employer, were dull, cliched, two-dimensional caricatures. i didn't find them believable, so i really didn't care what happened to any of them. i mean, the main character's best friends were named "sarah" and "josh." need i say more? it was disappointing, because it sounded like a great premise to me: an up-close look at the ultra-rich behaving badly. everyone loves that stuff - see The Simple Life, etc. it could have been very witty and fun, if it had a plot that actually went somewhere and characters that the reader could care about. the book also had a very dated feel to it, even though it was only published four years ago, because of the frequent reference to cell-phone ownership to signify that someone is rich/spoiled/important/annoying. i mean, come on. even in 2002 cell phones weren't that uncommon. i didn't have one, but i knew a lot of non-rich people who did. it's unfortunate that the authors chose to attach so much character-defining meaning to a device that became ubiquitous so quickly. plus, the ending was unnecessarily depressing. that was really the cherry on top - an incredibly unsatisfying finale to a thoroughly unsatisfying experience. RECOMMENDATION: do not read this book. but keep your fingers crossed that the movie, coming out soon (starring scarlett johansson), will make better use of this potentially interesting material. Is the book more, or less boring than this post? Where does your monicker come from ("...the Pest"). Are you a stalker?